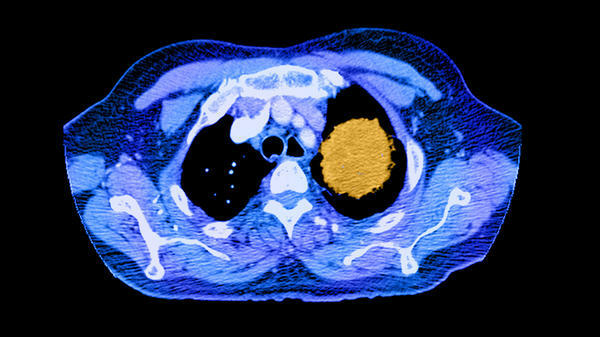 CT scans can help identify lung cancer early when it's more treatable, but for every cancer found these tests produce dozens of false alarms. That's led researchers at the Veterans Health Administration to weigh the overall costs and benefits of cancer screening. NPR's Richard Harris reports. RICHARD HARRIS, BYLINE: Federal health officials and other medical groups recommend low-dose CT scans to help detect lung cancer, specifically in older people who have smoked the equivalent of more than two packs a day for 15 years. The procedure typically costs $300, and it involves a quick trip to the radiologist. LINDA KINSINGER: I have heard people say, you know, what's the big deal? It's just a CT. And I think what we tried to show is it is a lot more than just a CT.
HARRIS: Dr. Linda Kinsinger wanted to know how challenging it would be for the Veterans Health Administration to offer this to its clientele, so she coordinated a study involving eight VA hospitals. It turns out that it wasn't even simple to identify the heavy smokers or to convince eligible vets to take the test even though it was offered at no cost. KINSINGER: We didn't record their reasons for why they declined, but just a little over half actually accepted screening. That was kind of a surprise to us. HARRIS: About 2,100 people ultimately took the test, and of those, 1,200 were told they had suspicious nodules in their lungs. The study found twice the rate of false readings from previous studies, and people who had lung nodules needed follow-up exams, scans and sometimes even biopsies. From that massive effort, they found about 20 treatable cancers. From your experience, do you think this is a good idea? KINSINGER: I think it's a close call. HARRIS: It was certainly worth it for the 20 people who were sent on to get therapy for their cancers. KINSINGER: But that has to be weighed against the amount of effort on the part of both patients and staff and the anxiety, the worry that a false alarm will cause among patients. HARRIS: Kinsinger's study is published in JAMA Internal Medicine. It's accompanied by an editorial by journal editor Rita Redberg, who spoke via Skype. RITA REDBERG: I think a lot of people have a much rosier view of screening in general than the facts bear out because very few people are actually helped by screening, and a lot of times there are a number of harms. HARRIS: Dr. Redberg notes that in addition to all the false alarms, lung cancer screening programs also draw in many people who are at low risk for lung cancer in the first place. REDBERG: Once the center has the ability to do the screening, they'd like to use their technology to do as many people as possible and it seems that low-risk people who are really unlikely to get any benefit and are more likely to get harmed are getting screened in bigger numbers than the high-risk people who are supposed to be screened. HARRIS: That may make sense for certain people given their individual circumstances, but overall it isn't a good use of health care dollars. Richard Harris, NPR News. (SOUNDBITE OF TALKDEMONIC SONG, "MOUNTAINTOPS IN CAVES") Transcript provided by NPR, Copyright NPR.